Diana Thater, A Runaway World (background), As Radical As Reality (foreground), 2017. 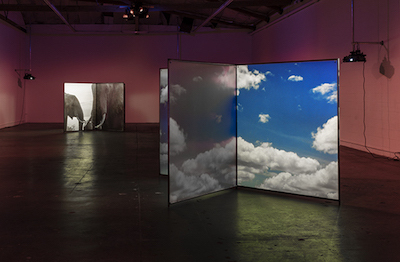 The installation view at The Mistake Room, Los Angeles, 2017. Photo by: Fredrik Nilsen. Diana Thater: A Runaway World (September 16, 2017‒February 18, 2018) comprises five video-based installations: three newly commissioned and two earlier works to provide context for the artist's examination of environmental issues. As Radical As Reality(2017) and A Runaway World (2017) were commissioned by The Mistake Room for the spring 2017 exhibition, that was also titled A Runaway World. The new installations incorporate video of elephants hunted by poachers for ivory; the last male Northern white rhinoceros, a species hunted to extinction for its horns; and the landscapes they inhabit. Thater and her crew gained unprecedented access to the creatures living in enclosures protected by armed guards. The videos are projected onto specially made X-shaped screens designed by the artist to create an immersive and somewhat disorienting experience.